The award winning battery-powered HD mini projector, the P300 features a revolutionary new compact optical engine capable of delivering 500 peak lumens at a high-definition (HD) resolution of 1280x800. Powered by Texas Instruments' DLP Technology, the AAXA P300 employs Vibrant Color LED technology that delivers dazzling color quality with an operating life of more than 20,000 hours and is capable of generating a viewing experience of up to 120". Minimum Diagonal Image Size 10"
The P300 comes packed with 500 lumens of brightness. Makes your photos and videos stand out in front of your audience. Using AAXA Vibrant Color Technology, the P300 delivers outstanding color contrast and video resolution. With the built-in battery, the P300 is your best battery powered projector choice. The Vibrant Color Technology and triple LED light source in the P300 produces a vivid display with amazing color saturation for over 20,000 hours of video projection. The P300's LED light source lasts 10 times longer than conventional lamps so bulb changes are a thing of the past! Fitting perfectly inside your suitcase, the P300 is ultra-portable and has an optional rechargeable battery for presenting on the go. 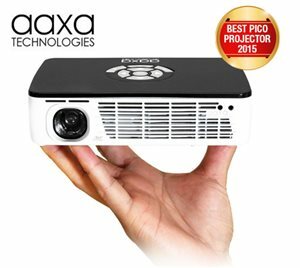 Measuring in at 5.9” long x 3.8” wide x 1.5” tall and 0.97lbs, the P300 pico projector is a perfect travel companion. Built with loud 2W speakers, the P300 will let you do amazing video presentations without the need for an external speaker. Multiple input sources are standard ncluding a full-sized HDMI port, VGA, composite AV, microSD, and USB thumb-drives. Multiple input sources allow easy connection with a wide array of media sources including smart-phones, tablets, DVD players, and laptops. The 3.5mm headphone jack allows audio output to portable speakers or an external amplifier. The P300 pico projector has keystone adjustment. This means never watch a distorted image again. Simply place the P300 pico projector on any surface and it use the manual keystone to adjust the shape of your projected image to the correct shape. The P300's LED light source lasts 10 times longer than conventional lamps so bulb changes are a thing of the past! Long warm-up and cool down times, sometimes for several minutes, are required for projectors using traditional lamps. The LED light source enables the P300 to achieve full brightness within seconds. Of course, it turns off instantly as well. The P300's LED light source consumes less power. The LED is also 100% free of mercury and, as the bulb never needs to be replaced, there are no discarded bulbs.